Start up a conversation about holiday pies, and you’ll find that people are passionate and opinionated about their Thanksgiving favorites. When it comes to pumpkin pie in particular, well, there’s just a lot of opinions about the filling, the crust, the topping, and the temperature pumpkin pie should be served. To be perfectly honest, I’ve tried to love pumpkin pie all of my life. I’ve tried it extra-sweet, creamy, cold, whipped cream-topped, soft crust, crispy crust, and every variation in between. What’s wrong with me? To this day I find pumpkin pie rather… boring and obligatory. So while I’m waiting for the pumpkin pie recipes from you that will surely change my mind (please! ), I’m offering up a pie of a different sorts. 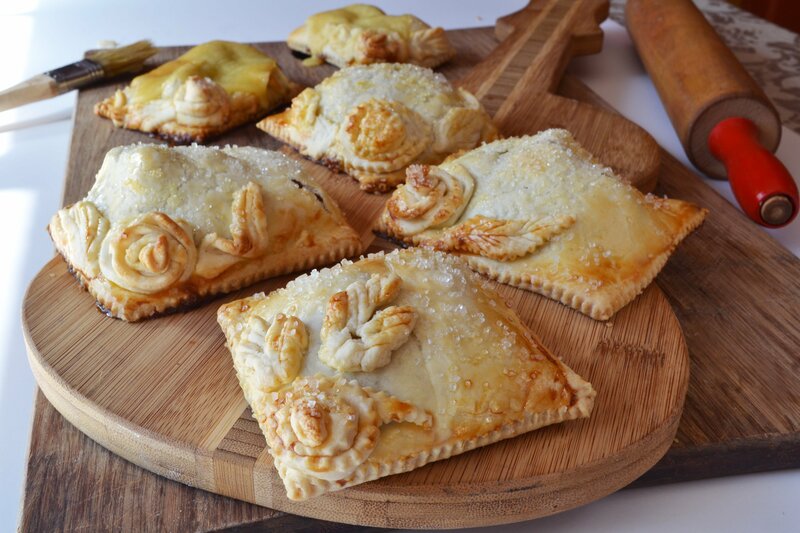 Delicious, beautifully presented, miniature fruit pie that reflects my Italian heritage – the Apple Pie Ravioli. After all, this is the time of year when we do things a little more special, a little more glittery, a little more memorable. These Apple Pie Ravioli look like you’ve spent time at a culinary institute, but they’re actually quite simple, beginning with store-bought refrigerated pie dough. The filling is the same as a delicious homemade apple pie, and with some dough cutouts and a little sprinkle of decorative sugar, you have gorgeous, individual holiday mini pies that will wow your guests. You wouldn’t necessarily be cheating on your traditional go-to pumpkin pie, you’d just give people something else to talk about! Can be made ahead and frozen. Fantastic! In a medium pot on low heat, cook apples, brown sugar, flour, butter, cinnamon, and lemon juice until apples are softened (about 15 minutes - make sure you don't over-cook apples so they turn to sauce). After apples are cooked, roll out dough, one package at a time, and cut into approximately 2" squares. Place about a tablespoon of apple mixture in the center of one square of dough and cover with another square. Pinch around the edges to seal. If you have a ravioli cutter or pastry wheel, run along the edges to finish. Brush lightly with egg mixture and sprinkle decorative sugar over top. Use leftover dough to make flowers, roses, or leaves. Bake at 350ºF for about 20 minutes, or until apple pie ravioli are golden-brown.